Asteroid (489) Comacina will occult TYC 5645-00648-1 on 2013 July August 24 from 6:13 UT to 6:17 UT (Friday, August 23, from 11:13 – 11:17 PM Pacific Daylight Time). The star has a reported magnitude of 11.5. The star’s position is RA 17h21m37.1s, Dec: -08:49:20, J2000. This shadow of this main belt asteroid will pass north to south through over half of the RECON telescope sites and should provide a great opportunity to get several chords on the asteroid. It will also be a great opportunity for many in the network to observe their first occultation event. The estimated maximum duration is 13.8 seconds. All RECON sites should start recording at 06:13:00 UT and run until 06:17:00 UT (four minutes total). Sense-up time is 8x. In general, remember that we generally want to use the smallest sense-up (ie., fastest rate) where we can still see the target star. This number was generated from data taken the night of Aug. 22 in Tonopah. We could still see the stars at 4x and 2x but upon closer examination the data showed 0-flux drop outs at these speeds. The data look solid at 8x. The gibbous moon will be 112 degrees away to the east during the event. A variation of the prior pointing techniques we have used at Yerington and Tonopah is to do a “precise goto” to each of these stars (starting with 35 Eta Oph) to figure out the final pointing offset pattern from the precise goto. By the time we tried this on a few we were ready to go to the final field and it worked really well to get the field quickly. Remember, you want to use sense-up of x128 for finding the field. Once you’ve got it, drop the rate back to the value shown above. 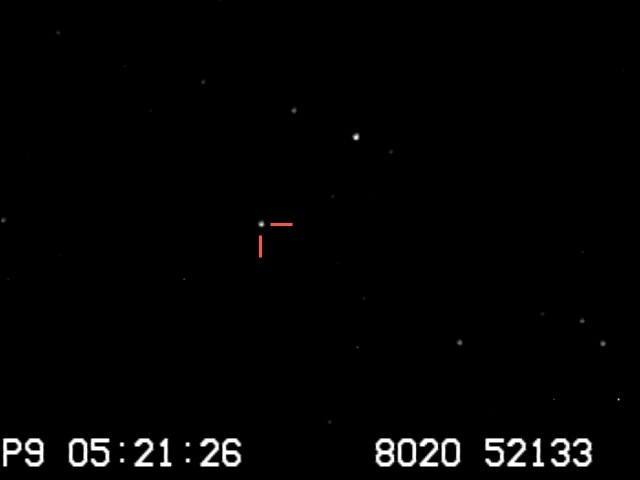 The image below shows the Comacina star field at a sense-up of x128. The image was taken using a C-11 on an equatorial mount, but the field has been rotated to approximate the field orientation for an alt-az mount at the time of the occultation. The target star is highlighted using red tick marks. The asteroid profile below shows preliminary results for Comacina. To view other asteroid results from North America, visit www.asteroidoccultation.com/observations/Results/.